Let’s be honest. This is not the Thanksgiving blog we thought I’d be writing this year. But here we are. 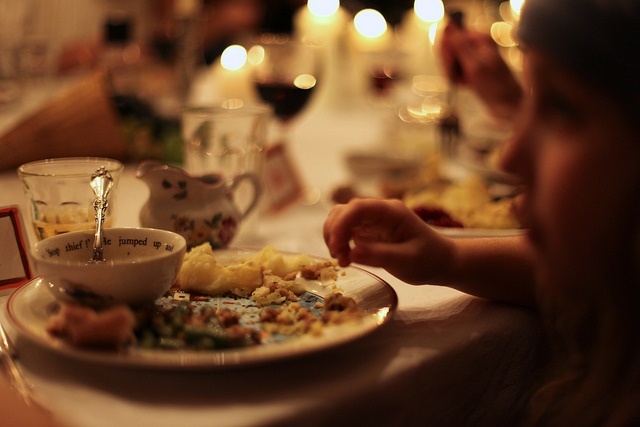 Most of us are still reeling from the surprise election results just a couple of weeks ago and can’t quite wrap our head around how to politely sit around a holiday table with family to discuss it. Maybe you’re one of the lucky ones who come from a completely like-minded family, and this Thanksgiving will be an opportunity to commiserate. The vast majority of us, however, face a table with a diversity of viewpoints – some we like, others we don’t. It’s almost enough to make you skip the trip home for the long weekend or avoid tough conversations altogether. But if there’s any lesson we can learn from this election, it’s that tough conversations are exactly the types of conversations we need to be having. We lament how divisive our country has become, yet often resist efforts to truly understand how others view the world. They are not crazy. Most do not hate immigrants or wish to see them all deported. Some have anti-immigrant positions based on fear – whether it’s fear of someone different from themselves or fear of being left behind in an economy where it is harder to succeed. Much of this fear stems from a lack of information, or worse yet, misinformation that feeds on these fears. If we can approach the holidays with a desire to understand the origins of others’ perspectives, alongside a commitment to engage in these conversations, progress can begin right at home. Many voters in 2016 expressed a feeling of disenfranchisement – they feel that government is unresponsive to their needs and that conversations in Washington don’t relate to their real lives. Don’t be the condescending relative who cuts them off to show just how right you are. Let others express themselves, and take the time to really hear their viewpoint. Ask probing questions about why they think the way they do. Even if you disagree, it’s important to understand where they are coming from. Immigration is such an integral part of America’s history that it should unite us, not divide us. Do your relatives have a shared experience with today’s refugees who seek safe haven from war? Can we agree that one’s religion should never be something for which one is persecuted or discriminated against? Did we or our family members come to this country with nothing, work hard, and find success based on a dream of a better life? These are the stories of today’s immigrants just as they were decades and centuries ago. Don’t be afraid to defend your viewpoint. Given the extreme immigration policies the next Administration intends to adopt, there has never been a more important time to stand up for what you believe is right. Lean in to these hard conversations by boldly telling others that you stand with the immigrant community, regardless of the language they speak, the country from which they came, or the religion they practice. Share why the immigrant experience matters to you; why the fair and just treatment of immigrants is a critical American value you intend to uphold. Offer to help check the facts. With all that the internet does to make information access easier, it can be harder than ever to discern fact from fiction. If others have heard that refugees present a security risk, point them to studies showing how thoroughly vetted they are. If there are worries about the economy and job security, share articles explaining how immigrant entrepreneurs are job creators and immigrant workers stimulate the U.S. economy. If there are concerns about crime, provide statistics about how immigrants are less likely to commit crimes than those who are born in the U.S. The facts matter, and you can help build a bridge to greater understanding. Ask them to bear witness. Urge others not to stand idly by if our neighbors, friends, teachers, fellow congregants, or community members are targeted for deportation, discrimination or harassment. If a country can treat its vulnerable members in the harshest of ways, what does that say for those of us who do nothing? Encourage them to stand for equal treatment of all people under the law, without exception. There’s nothing more American. These will be difficult conversations to be sure, but if we are to build a more compassionate society that honors the dignity of every hard-working family, there is no better time than the present. As Martin Luther King, Jr. has reminded us, “The arc of the moral universe is long, but it bends toward justice.” Happy Thanksgiving.